TOPIC: how footswitch work ? hi i'm have a problem about the process of footswitch . As far as i know, footswitch is true bypass. Meaning, if its set to bypass mode, the signal will go from the input directly to the output of pedalshield, thus there is no need for software programming. Last Edit: 2 years 1 month ago by BowDown. yes, as nik said it is true bypass, meaning that when the effect is off or bypassed the guitar signal goes straight from input to output. The pin7 of the DUE will "feel" when the 3pdt footswitch is activated or not, the pin will be high when the effect is not working and low when is on. I found this image searching for this topic..
- The green is the signal flow then the effect is not working (true bypass mode). - The red flow is when the pedal is engaged. And how exactly does the pin7 know that it is active ? 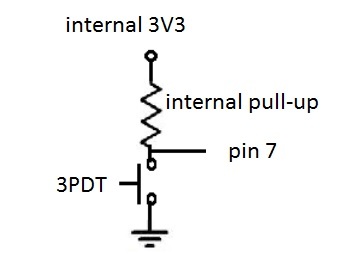 Son when it is pushed, the pin 7 is connected to ground (and the Arduino reads a '0') and when is not pushed the arduino sees the pull-up resistor which is 3V3. Last Edit: 1 year 3 months ago by Ray.